The DFS1 Digital FiberScope supports magnified video inspection of optical fiber connector end-faces during fiber optic cable and connector installation and maintenance. The ergonomically designed hand-held unit illuminates fiber end-faces and delivers magnified images via USB port to AFL’s M-series OTDRs (M210, M200, M700) or C-series OTDRs and Certification Testers (C840, C850, C860, C880). FiberScope software displays, labels and stores captured images as part of connector installation and/or maintenance records. A large adjustment knob permits easy focusing using real-time view. Once focused, a conveniently located trigger button signals the attached display device to capture the image for analysis and archiving. The scope’s ergonomic shape and control locations support comfortable, single-handed operation. The DFS1 is powered through the USB port, eliminating the need for an additional battery or AC power supplies. Electronic video inspection eliminates all danger of eye damage from active (lit) fibers carrying either visible or infrared wavelengths. 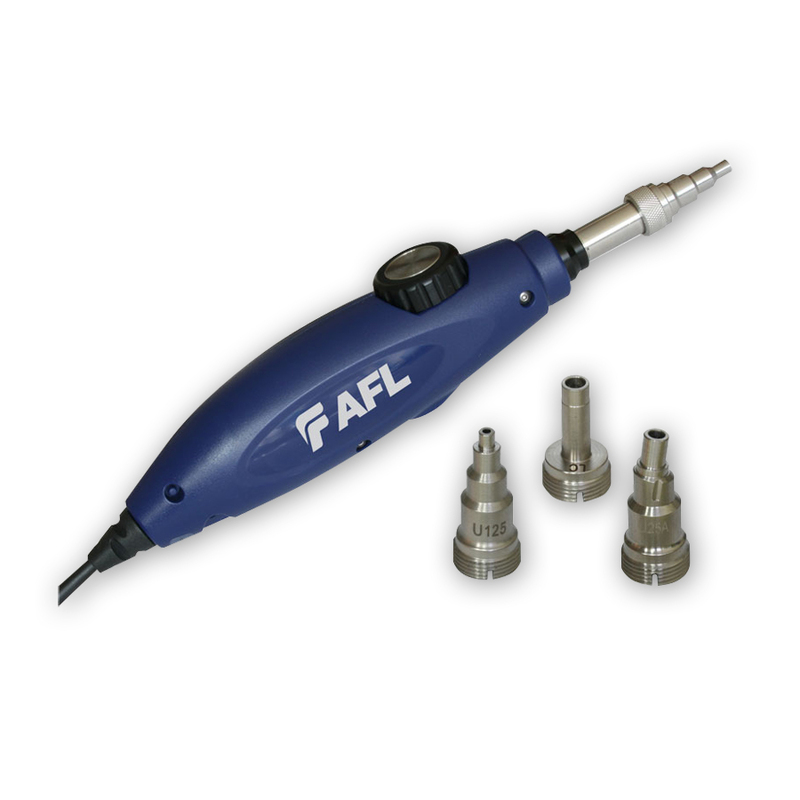 An extensive assortment of adapters supports inspection of a wide range of optical jumper cable connector ferrules and bulkhead adapters. Bulkhead adapter tips are available in multiple lengths as well as 60° angle. Connector adapters are available for PC, UPC or APC polished ferrules in 1.25 mm, 2.5 mm and other diameters. The DFS1 is available in three different kits which provide either PC/UPC adapters, APC adapters or no adapters. 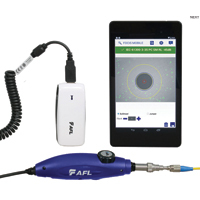 AFL SimpleView™ Fiber Inspection Software is an application, which permits the DFS1 Digital FiberScope to be used with Windows® XP or Windows® 7 computers. AFL SimpleView software displays a live, high-resolution video image of the endface of an optical fiber on the PC’s display. SimpleView software is a free download www.AFLglobal.com. 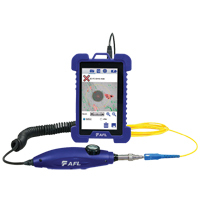 The FOCIS WiFi PRO system combines AFL’s powerful fiber connector inspection and analysis with the familiar ease of a smart device. FOCIS WiFi PRO works the way you do – connected to your phone or tablet. FOCIS WiFi PRO enables mobile workers to complete remote fiber optic connector inspection tasks while remaining connected to coworkers and managers. FOCIS WiFi PRO automatically analyzes connector integrity according to IEC 61300-3-35, AT&T TP-76461, or user defined standards and save, recall and share results via email, text or mobile cloud applications. 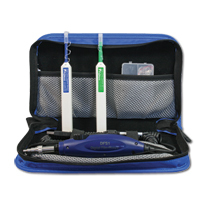 The FOCIS WiFi system consists of the proven DFS1 Digital FiberScope and a Portable Application Link WiFi unit. It also includes AFL FOCIS application software available for iPhone and IPad as well as Android smart devices. The AFL FOCIS application software enables users to view live images on their smart devices, save, recall and share saved end-face images via e-mail, text of text attachment and mobile cloud applications like Dropbox and Google Drive. AFL FMPR-00-04XN FOCIS WiFi PRO Kit, No Tips, No Cleaners. Includes DFS1 Digital Fiberscope, Portable Application Link with FOCIS WiFi PRO software license, holster/belt clip, AC adapter, soft carry case. AFL FMVU-00-04XN FOCIS WiFi VIEW Kit, No Tips, No Cleaners. Includes DFS1 Digital Fiberscope, Portable Application Link with FOCIS WiFi VIEW software license, holster/belt clip, AC adapter, soft carry case.